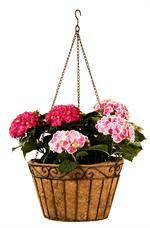 Our replacement coco liners are molded to fit your Deer Park basket perfectly! LINER ONLY. Replacement coco liner is designed to fit your Basket Wheelbarrow (WH103) perfectly. Coco fiber is a natural product providing proper drainage and a healthy environment for your plants and flowers to grow. LINER ONLY. 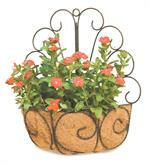 Replacement coco liner is designed to fit your Finial "X" Wall Basket (WB134) perfectly. Coco fiber liners is a natural product providing proper drainage and a healthy environment for your plants and flowers to grow. LINER ONLY. 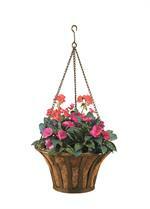 Replacement coco liner is designed to fit your French Hanging Basket (BA131) perfectly. Coco fiber is a natural product providing proper drainage and a healthy environment for your plants and flowers to grow. Also fits other 12" baskets. LINER ONLY. Replacement coco liner is designed to fit your Large Diamond Window Box (WB139) perfectly. Coco fiber liners is a natural product providing proper drainage and a healthy environment for your plants and flowers to grow. LINER ONLY. Replacement coco liner is designed to fit your Large Finial Window Box (WB137) perfectly. Coco fiber liners is a natural product providing proper drainage and a healthy environment for your plants and flowers to grow. LINER ONLY. Replacement coco liner is designed to fit your Large French Window Box (WB120) perfectly. Coco fiber liners is a natural product providing proper drainage and a healthy environment for your plants and flowers to grow. LINER ONLY. Replacement coco liner is designed to fit your Large Solera Window Box (WB125) perfectly. Coco fiber liners is a natural product providing proper drainage and a healthy environment for your plants and flowers to grow. LINER ONLY. Replacement coco liner is designed to fit your Mini Round Basket (BA120) perfectly. Coco fiber is a natural product providing proper drainage and a healthy environment for your plants and flowers to grow. Also fits other 10" Baskets. LINER ONLY. Replacement coco liner is designed to fit your Mini Square Basket (BA104) perfectly. Coco fiber is a natural product providing proper drainage and a healthy environment for your plants and flowers to grow. LINER ONLY. 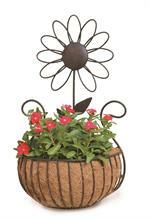 Replacement coco liner is designed to fit your Oval Twist Basket (BA202) perfectly. Coco fiber is a natural product providing proper drainage and a healthy environment for your plants and flowers to grow. LINER ONLY. 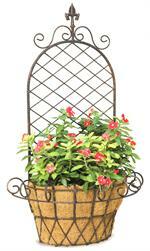 Replacement coco liner is designed to fit your Peacock Wall Basket (WB107) perfectly. Coco fiber is a natural product providing proper drainage and a healthy environment for your plants to grow. LINER ONLY. Replacement coco liner is designed to fit your Small Diamond Window Box (WB138) perfectly. Coco fiber liners is a natural product providing proper drainage and a healthy environment for your plants and flowers to grow. LINER ONLY. Replacement coco liner is designed to fit your Small Finial Window Box (WB136) perfectly. Coco fiber liners is a natural product providing proper drainage and a healthy environment for your plants and flowers to grow. LINER ONLY. Replacement coco liner is designed to fit your Small French Window Box (WB119) perfectly. Coco fiber is a natural product providing proper drainage and a healthy environment for your plants and flowers to grow. LINER ONLY. 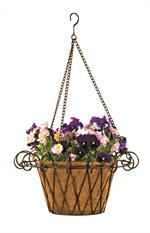 Replacement coco liner is designed to fit your Solera Hanging Basket (BA203) and Solera Basket (BA206) perfectly. Coco fiber is a natural product. Also fits other 14" Baskets.